French industrial production declined by 1.8% in September. Manufacturing production of consumer durables saw the biggest drop at -6.3% month-on-month- a two-year low, while construction activity rebounded by 3.8%. These figures affected the size of the rebound in industrial production that was expected for 3Q18 and which finally reached 0.7% QoQ after two negative quarters. These figures provide some insight into the 0.4% QoQ GDP growth rebound estimated for 3Q18. Manufacturing production growth accelerated slightly from 0.2% to 0.5% QoQ in 3Q18, with opposing trends in investments good production (which posted a 1.8% QoQ growth) and in consumer durables (which contracted by 0.5% QoQ after a 2.2% fall QoQ in 2Q18). This mainly reflects the production delays in the car industry due to new emissions standards since the summer. The 1.1% decline in car production in 3Q18 should, therefore, reverse in coming quarters and is not a sign of moribund consumer demand. The manufacturing production figures also show that business investment is still driving domestic demand. 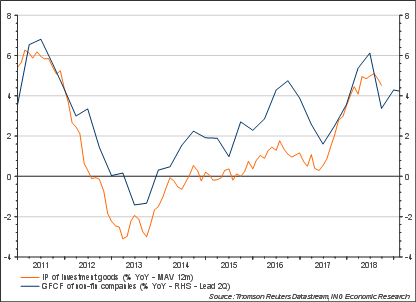 And activity in construction seemed to accelerate again after a strong 3.7% QoQ contraction in the first quarter: the good activity figures for September brought 3Q18 growth to 1.9% QoQ after 1.7% QoQ in 2Q18. Looking at the current level of business investment, it seems that manufacturing production could maintain a positive growth rate on average for the next six months, especially if the car industry rebounds in the coming months. Industrial surveys are showing that despite a decline in the economic outlook, capacity utilisation is not declining significantly while export order books remain full. Another argument supporting the idea that the blip in consumer durable production is temporary is the fact that private consumption rebounded by 0.5% QoQ in 3Q18 after a 0.1% decline registered in 2Q. If oil prices are still weighing on purchasing power, a positive fiscal impulse is counterbalancing part of it, allowing purchasing power to grow in the second half of the year despite limited gains in the job market. We therefore expect the rebound to be repeated in 4Q18. Overall however, we believe private consumption growth will be limited to 1% this year after 1.2% in 2017. In 2019, with no fiscal headwinds and after the energy price shock has been digested, decreasing unemployment should play its role and allow for more dynamic private consumption growth of 1.5%. President Emmanuel Macron is still looking for a way to restore his popularity. A WWI memorial tour this week was supposed to help in this regard, but higher energy costs have been working against him. His last approval rating is at 27%, with 44% of French people not trusting him “at all”. These results show how divided France is 18 months after the last election. President Macron still has strong support inside his party but is failing to attract other voters, despite a historically weak opposition both from the right and the left. This does not sound like a good starting point for the European election campaign, which is likely to be dominated by domestic issues. The reform calendar signals a difficult debate (beginning on 9 November) between social partners over unemployment benefit reform. The likelihood of striking an agreement by mid-January, notably on a 1.5 billion structural spending cut, is low, and the government will probably have to omit details of this in the middle of the election campaign, which is likely to make life easier for the extreme right and left on the campaign trail.